When soybean yields vary dramatically from field to field, or even within the same field, farmers want to know why. There can be several causes, such as too much drainage, which leads to dry soils and moisture stress. Or if there’s too little drainage, the result can be wet soils and, therefore, all too often, disease. But it’s soybean cyst nematode (SCN) that continues to be perhaps the biggest problem in soybeans across the United States and Canada. Every year, the area affected by the disease grows larger. According to a recent North Dakota State University study, it’s the most damaging U.S. soybean disease. Check out this diagram to see how SCN is spreading. A great time to sample for SCN is in the fall, right before or after harvest. Typically, this is a good indication of what the population will be in the spring. The disease is often found in parts of the field such as entrances, shelterbelts, and flood prone or low spots—where soil from other areas is being deposited. The plants are often stunted, possibly a lighter shade of green, and might suffer significant loss at season’s end. But SCN can also be present throughout the field in pockets that aren’t as easy to spot, and it can lay dormant for years in some cases. Often, the areas within the field where symptoms showed up later in the season, after the last major scouting activities, were where the disease had not been seen or noted during the earlier scouting. Using a satellite image like the one below from WinField’s R7® Tool can direct scouting efforts to ensure you are taking a sample from an area with reduced yield or possible cyst symptoms. This can be done before or after harvest but preferably before field tillage. 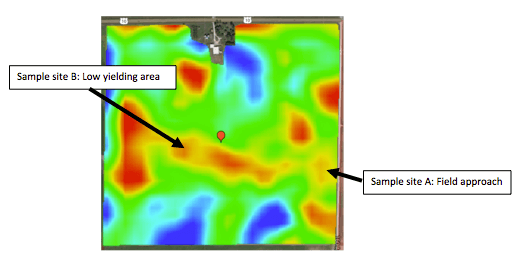 A satellite image shows where yield is potentially higher and lower, so sampling in the red or lower-yield areas for SCN enables us to get an accurate sample site to test for SCN. It is also important to know what the levels are in the rest of the field, too, including the areas with good yields. By projecting a satellite image into a program such as Google Earth, you can walk a field and go directly to one of the low-yielding spots to take your sample. That will help your scouting and save time.